If ever a king there was of the Realm of Portland Food, it was Henry Thiele. As a celebrity chef, caterer to the social elite of Portland, spokesman for food and wine, purveyor of Princess Charlotte pudding, German pancakes, and bratwurst with sweet-and-sour lentils, Henry reigned as chef supreme from his arrival in town in 1914 until his death in 1952. 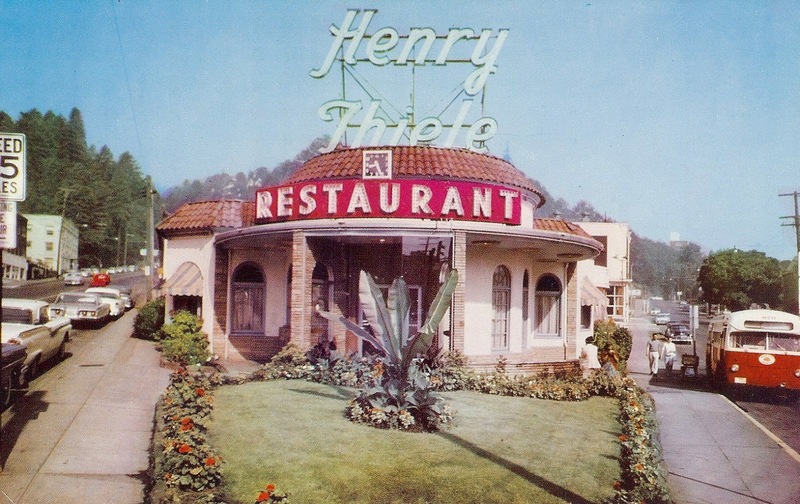 And his name and fame lived on; Henry Thiele’s restaurant, helmed by his widow Margaret, lasted another four decades, finally closing in 1990. Henry Thiele was born in Hanover, Germany, in 1882; his father ran a hotel, but died in 1885. His mother died in 1898, by which time young Henry had already been exposed to winemaking and confectionary creation in Germany and Switzerland. In 1904, Henry emigrated to the United States, where he found work in hotel restaurants in New York City and San Francisco, and cooked in Nome, in Canada, and in Seattle before arriving in Portland in 1914. 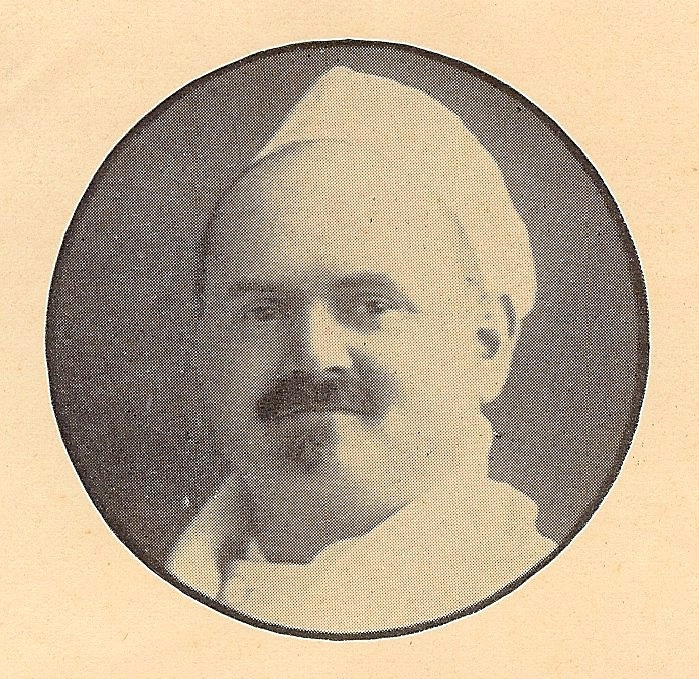 Here he was hired by the entrepreneurial Simon Benson as chef of his Hotel Benson, and here he thrived. 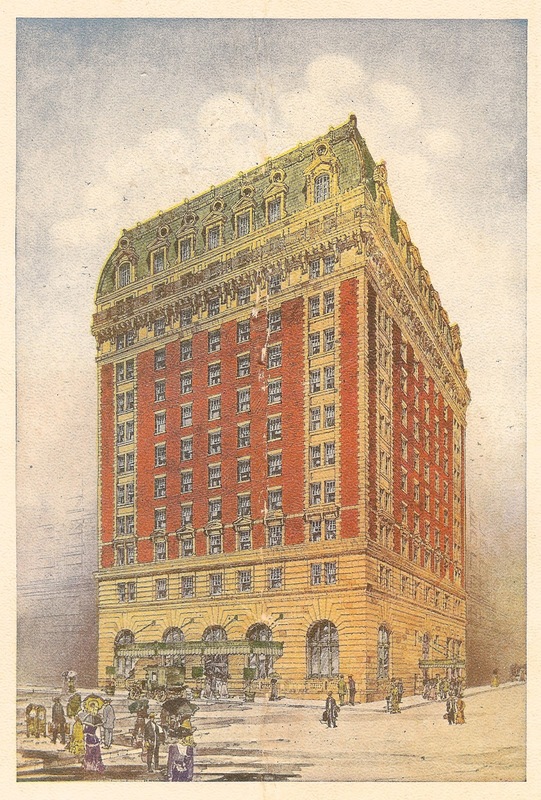 Simon Benson aimed to make his hotel the premier society flashpoint of the city, in which endeavor he had formidable competition from the Portland and Multnomah Hotels. But the genial Thiele soon had a following, and the Benson did much catering for women’s clubs and business gatherings. His European training and experience gave him a cachet, and his dishes achieved local fame. 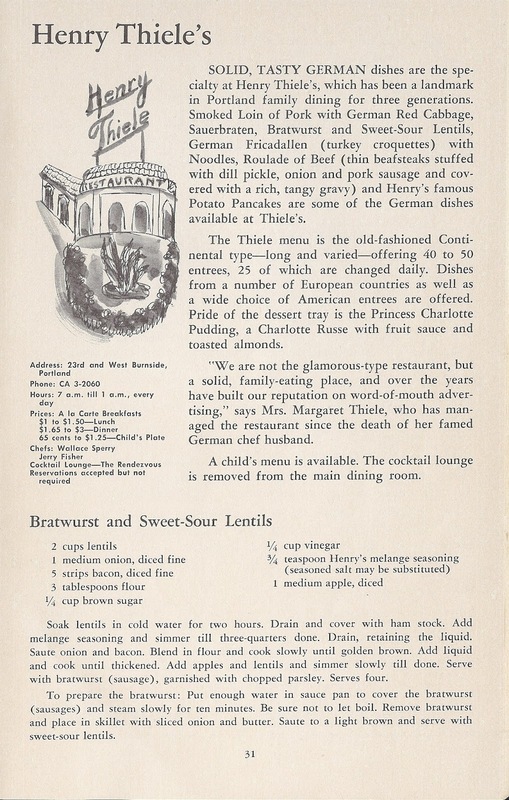 James Beard wrote two pages of praise for Thiele’s masterful cooking in his autobiographical Delights and Prejudices. “This man had a fawning manner and great ambition, but he was a great, creative chef,” said Beard. 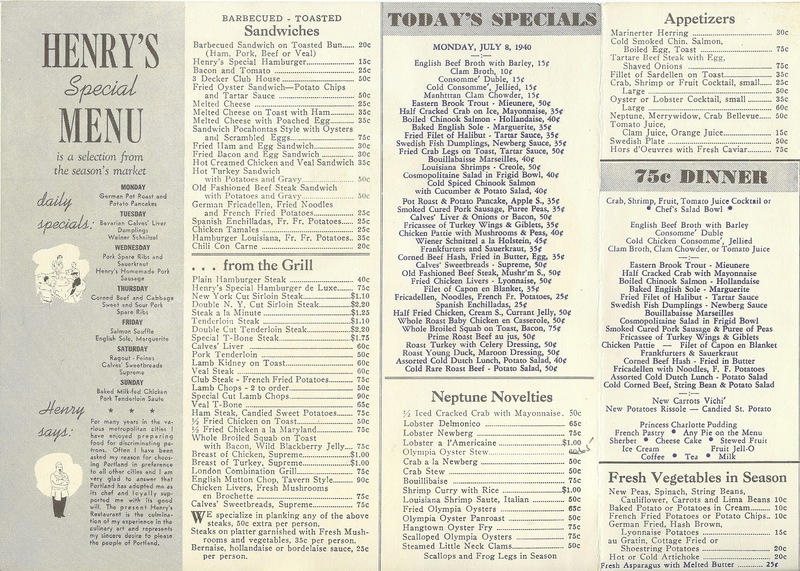 The menus that Thiele devised for the Benson were notable for their breadth, their fish and shellfish dishes, their desserts, and the fact that the fancy menu was almost devoid of fancy French terminology: it was in plain English. 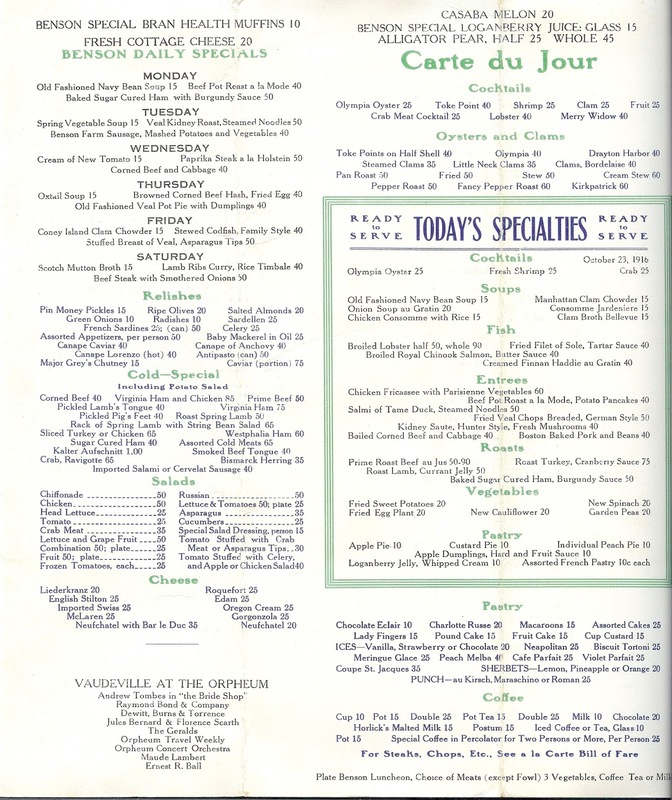 In the early and middle 1920s, Thiele left the Benson for several restaurant adventures on his own. He opened a grill in the new Sovereign, a residence hotel; he took on the management of Simon Benson’s new Columbia Gorge Hotel near Hood River; he delivered box lunches on a fleet of motorcycles; he angled to operate the restaurant at the new lodge at Multnomah Falls; he opened a large new restaurant on SW 10th Avenue north of Morrison Street, and a coffee shop on Alder. These did not all pan out, and at one point Thiele faced bankruptcy. Thiele regrouped (he had many good and wealthy friends in the business community), and in 1932 he opened Henry Thiele’s at the triangle corner of West Burnside and NW Westover Road at NW 23rd Avenue. 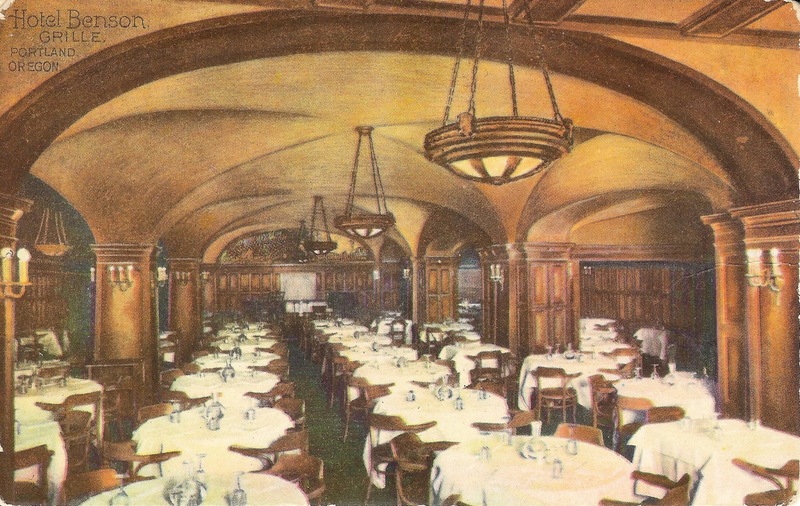 The restaurant became a Portland institution, a family eating-place for the wealthy of Portland Heights and the elderly widows in Nob Hill apartment buildings. Noted for its German-influenced dishes (still described in plain English), for immense German pancakes and huge platters of deep-friend smelt, Henry Thiele’s marched on even after the death of the master chef in 1952. Thiele’s young widow, Margaret, carried on for nearly four more decades, assisted by Henry Jr. (and Henry III); Margaret re-married to August Petti, an Italian-born clothing designer who took on the role of suave and genial host. According to Beard, “Thiele’s salmon dishes were his true forte and became the feature of the Columbia Gorge Hotel, which Mr. Benson … built for him. I can remember a whole baked salmon done with cream, and fillets of salmon stuffed with a salmon mousse and then poached in a court bouillon.” Although Beard says that Thiele later “became a mass producer without any of the finesse he had brought to his original kitchens,” he brought to Portland a culinary sophistication and talent that made him an early version of the celebrity chef. One hot summer day in the early 1970s, when I was working a split shift as a busboy at Rose’s Restaurant nearby, I went over to Henry Thiele’s and I splurged: I got three Princess Charlotte puddings, to go. The three cost me $1.05. Each was a perfect dollop of creamy pudding with toasted almonds capped with a rich red syrup. I wish I could still get one.